CEOP and Brook have published new research which aims to explore and understand young people’s everyday use of technology within their relationships, and the ways in which the pleasures, harms and risks of interpersonal relationships may be influenced by technology. The project was motivated by the desire to evolve online safety education by providing an in-depth insight into young people’s views and experiences. Much of the focus of online safety work has been narrow – exploring the risks of online communication such as the unsafe sharing of personal details, the loss of control of material (especially images), and the facilitation of abusive and bullying behaviours. Research does not always recognise the positive role of digital technology in young people’s lives and the complicated ways in which young people experience and negotiate risk. The report hopes that a deeper understanding of the positives as well as risks will enable all agencies to deliver relevant, nuanced education that speaks to young people’s day to day experiences. 84% have flirted at least once or twice online and 87% face to face. 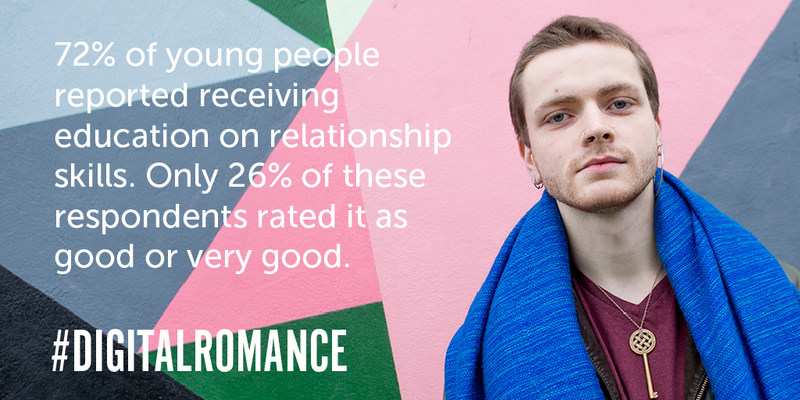 25% of young people report that they flirt online a lot and 23% report that they flirt face to face a lot. 6% of survey participants have met someone in person who they first met online who wasn’t who they said they were. Most participants had received education about online safety & relationships. What support would young people like to help them enjoy positive relationships online/offline without harm? This entry was posted in 2017, Brook, CEOP, Positive Healthy Relationships, PSHE, Research, RSE, Schools and tagged Brook, CEOP, Digital Relationships, Positive Healthy Relationships, Research, RSE. Bookmark the permalink.